Growing up, my siblings and I had a white plastic nativity set that we could set up and play with during the Christmas season. For the last few years, I've been looking for a nativity set that my children could enjoy. The Little People set seems to be popular, but I just don't like the look of it. I guess I'm picky, but I've also had it in my head that I'd like to make the nativity set. 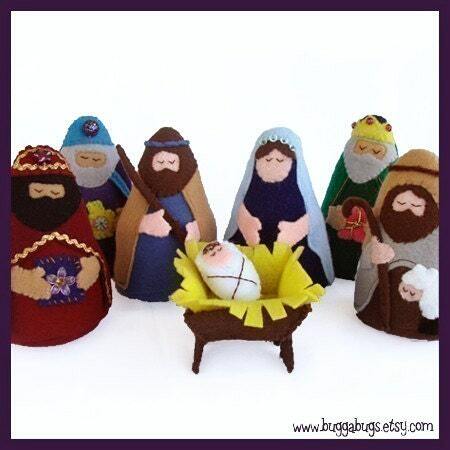 Two years ago, I purchased this nativity pattern from BuggaBugs on Etsy. The pattern is really well done, but I just haven't been able to find the time to actually complete it. Last year, the excuse was that I could not find flesh-toned felt. This year I'm determined to make at least the baby Jesus, Mary and Joseph. I even ordered some felt from one of my favorite shops on Etsy, Giant Dwarf. While Buddy was at preschool yesterday, Jellybean and I went to peruse the toy store. 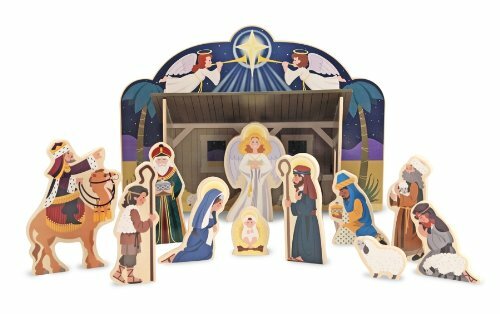 I noticed the Melissa and Doug nativity set was on sale and I liked the way it looked. So, I broke down and bought it. The kids have already taken to it, setting it up and moving the figures around. I still plan on making the other set, but at least they have something to play with in the meantime.